It’s impossible not to feel for the victims of natural disasters. Once the cable news networks have packed up their gear, the flood waters have receded, or the blazes been put out, thousands of people who fled the elements return home to pick up the pieces of their lives. However, with strong evidence linking climate change to the frequency and severity of wildfires as well as floods in the US, and with higher temperatures causing rising sea levels and stronger hurricanes, it sure would be nice if the people in some of the states most affected would help themselves by not electing science deniers into office. In North Carolina, for example, which was hit hard by flooding from Hurricane Florence earlier this month, the Republican state legislature in 2012 banned the use of a report that showed sea levels could rise up to 39 inches over the next century. The measure was introduced by State Rep. Pat McElraft, a former real-estate agent who has received big contributions from developers and the real-estate industry. It’s certainly conceivable that the legislation prevented the state and municipalities from taking action to combat flooding — and regular folks are now paying the price. Yet chances are that these same people will re-elect McElraft in November. And then there is Sen. Ted Cruz (R-TX), who, in this regard, is in a league of his own. He is one of the top GOP climate science deniers in the Senate, which is saying something. That alone, however, does not set him apart. Republicans in Congress like science about as much as they like helping minorities or doing something about gun violence. But Cruz, as well as the rest of the Lone Star State’s GOP delegation, are also world-class hypocrites when it comes to helping their fellow Americans who are trying to get back on their feet after suffering through a natural disaster. When the East Coast was devastated by Hurricane Sandy in 2012, which at the time was the second most expensive storm in US history, Cruz and other Texas Republicans led the opposition to legislation that would have provided funds to the affected states. They falsely claimed that the relief bill was laden with pork. At the time, Cruz claimed the relief legislation was a “Christmas tree for billions in unrelated spending.” The nonpartisan Congressional Research Service later showed that this claim was bogus, as the vast amount of funds went straight to disaster relief and recovery efforts. When the inevitable happened and Texas was hit by its own expensive superstorm, Hurricane Harvey, last year, the state’s Republicans predictably asked for, and received, tens of billions of dollars in funding to help those in need. But their hypocrisy was so blatant that even members of their own party called them out for it. “The congressional members in Texas are hypocrites … It was just a matter of time,” said then-New Jersey governor Chris Christie (R) at the time, noting that he had predicted this would happen. Did Cruz and the other Texans admit that they were wrong? Of course not. The senator actually doubled down on his false claims about the relief legislation for Hurricane Sandy, and the rest of the delegation preferred to just stay quiet. What this all means is that Cruz’s record is pretty awful when it comes to science and responding to natural disasters — or acting like a decent human being when other Americans are in need. In Texas, it has never hurt him before. But now a different kind of storm is brewing in the Lone Star state and Cruz is in peril of losing his seat. If Texans who care about those things are flooding the polls in November, then he might just get swept up by Hurricane Beto O’Rourke and the blue wave. 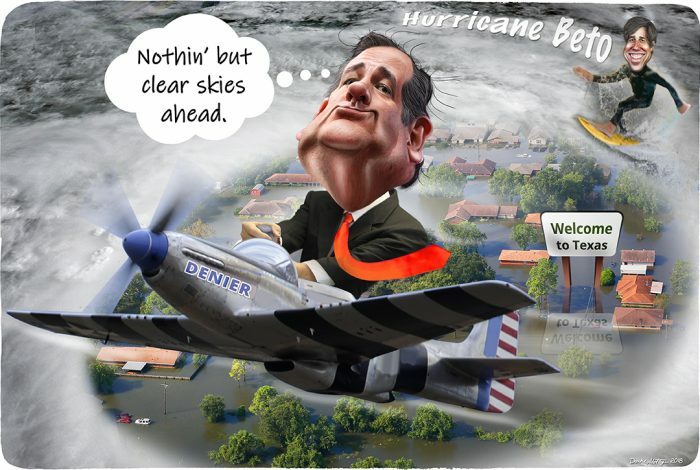 The cartoon above was created by DonkeyHotey for WhoWhatWhy from these images: Ted Cruz caricature (DonkeyHotey / Flickr – CC BY 2.0), Beto O’Rourke caricature (DonkeyHotey / Flickr – CC BY 2.0), hurricane (NOAA), plane (US Air Force), and surfer (Warren Brown / Flickr – CC BY-SA 2.0).